The program has been on quite the win streak as of late under Head Coach Gary Huber, who is entering his sixteenth season as head coach. The Braves have won nine consecutive Region IV titles and five straight Arrowhead Conference titles. This year’s team will look to carry on the winning tradition, but the Braves are currently only concerned with working hard and improving every day. “Our goal is to continue to improve every day, and hopefully by the end of the season we can win another Regional Championship,” Coach Huber said. Junior College athletes are usually with a program for a season or two before transferring to a four year college, but the Braves goal to qualify for the NJCAA National Tournament remains the same every year despite the roster constantly changing each year. To qualify for the National Tournament a team has to win or place second in their regional tournament. 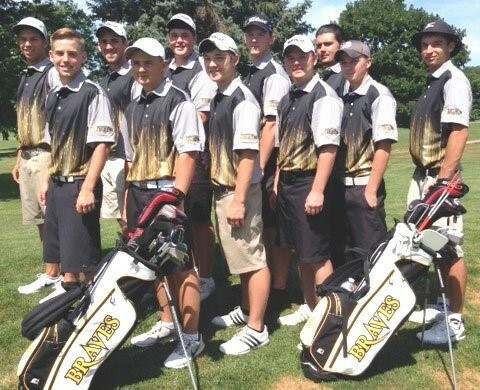 The Braves will be looking to win their tenth consecutive Region IV Tournament this fall, but sophomore Joe Hanlin, believes the team’s ultimate goal goes beyond just qualifying for the big tournament. “Honestly, I don’t think just qualifying is good enough for us. We want to make a statement by placing in the top five or winning the National Tournament,” Joe Hanlin said. It was only a year ago when Joe Hanlin was first making his debut with the program and now he’s the undeniable leader of the team. Hanlin was the only freshman to start last season, and this year he’s the only returning starter from a season ago. Hanlin knows what it takes to perform at the college level as a freshman, so his experience should benefit a team who has seven freshman on the roster. “A nice thing about a leader is you don’t have to look for them to lead they just step up and do it, and that’s what Joe has done. He has stepped up and has become our leader, and the guys look to him for leadership and guidance,” Coach Huber said. Hanlin is more than happy to help his teammates out whenever they need his guidance, but he doesn’t want to force his leadership on anyone. “I’m not trying to force my leadership on anyone. If my teammates are in need of my guidance I’ll always be there for them, but the team we have this year is excellent on the course,” Hanlin said. Out of the seven freshman on the team this year, Coach Huber knows one player particularly well, his son Keil Huber. Keil has been around the game of golf for most of his life, and when he considered the fact that his father taught him how to play the game, he thought it would be pretty cool to join him at Black Hawk. He has been watching the Braves since he was in the fifth grade, and over the years he has gained insight on how the team operates every year, which has him extremely confident going in to his freshman season. The Braves are off to a good start so far as they’ve already competed in two tournaments where they took first place at the Timber Creek Classic and the Carl Sandburg Classic. You can see the entire schedule for this season on the schools website.